Everyone and their mother knows about Ironworks/Gardens, but the new standard for Gardens enabling is here. Beggar! How cool is this dude!?. If you manage to collect all Gardens by the end of the game, each Beggar play will have added 2.4 VP. Comparable to Rebuild, a sick $5 card that adds 2 to 3 VP per play. Now you don’t have to be called WanderingWinder, -Stef- or Geronimoo to figure out Beggar and Gardens form a great combo, but you might want to consult with these guys if you’re facing the tough choice between a strongish engine like Hunting Party/Baron or Beggar/Gardens. Here’s me to help you out. Beggar/Gardens isn’t a rush strategy like Workshop/Gardens but a slog. (You might want to read the articles by the great WanderingWinder first). 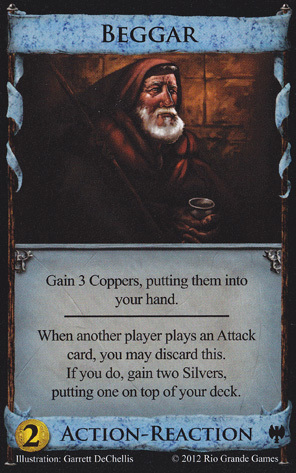 One notable aspect of the slog is that Copper is a good card instead of a liability. Another important property of the slog is that it does better the longer the game takes (unlike rushes and engines). Ideally you’ll want to be able to play a Beggar each turn for the entire game which means you need to get a healthy number of them before greening. The simulator suggests 6 Beggars if your opponent goes for a Combo, Big Money or Engine strategy (Beggar isn’t published yet in the sim so you can’t test it yourself). If your opponent mirrors you, then you should aim for 4 Beggars before trying to win the Gardens split. This might seem late, but remember that once the Gardens are gone the game becomes a slog where being able to reach Duchy $ is very important. The extra Beggars will ensure you have enough fuel for the rest of the game. If your opponent goes for a rush (like Workshop/Gardens) use the same advice of 4 Beggars before greening. At game end your Gardens will often be worth 7 Victory points which means an opponent aiming for Provinces needs to end the game as soon as possible. If your rushing, engining or comboing opponent tries to fight you for Gardens the green cards will hurt him a lot more than you. A typical big money strategy is Wharf BM. Beggar/Gardens beats it 4 out of 5 games. The Wharf deck can’t prevent Gardens reaching the 7VP treshold which means game over most of the time. Ironworks/Gardens will win only 1 out of 20 games because it’s not good at buying Duchies after the rush becomes a slog. Attacks often turn games into slogs and the reaction part of Beggar adds some more value. Now you can discard all your excess Beggars to gain Silvers and keep one in hand for the Coppers. Curses don’t really hurt (8 Gardens = -2 points from 10 Curses) so a Sea Hag or Mountebank centered deck doesn’t stand a chance. Discard attacks like Goons are a little stronger, but unless they’re part of a big engine they can’t really beat the Beggar/Gardens. Let’s take the Golden Deck (a deck that consists of exactly 5 cards: 1 Bishop, 2 Silver, 1 Gold, 1 Province which trashes a Province each turn). This can reliably empty the province pile in 16 turns which will beat the Beggar about half the time. If your opponent decides to use the Beggar for a different slog like Duchy/Duke he doesn’t stand a chance because Gardens will reach 5 VP when three piles are empty (Beggar, Copper, Gardens). The Duchy player doesn’t have time to gain enough 8VP Dukes to compensate. Hunting Party/Baron is a nice simple engine which beats the Gardens player by a few percentages if the engine player builds up enough before going for the 8 Provinces. A strong engine like Fishing Village/Wharf will win 9 out of 10 games so you really shouldn’t try to go for the Beggar when there’s a mega turn engine. The 10VP of Colony is better suited to fight 7VP Gardens. The stronger Big Money decks will now also be able to beat the Beggar and all the engines will perform much better (not just the mega ones). In conclusion this is a very strong combo that only gets beaten by the strongest engines or in Colony games. Just remember to load up on Beggars before greening and you should easily coast to victory with this little gem. This entry was posted in Combo of the Day. Bookmark the permalink. against beggar/gardens, the golden deck can be improved by buying gardens and bishoping them, preventing how many the opponent can get, and then buy provinces. and it’s 50.2:49.8 for the first. I ran some sims as well and can confirm that opening Beggar/Gardens is a viable alternative to first building the economy to 4 Beggars. It will win the Gardens split more often, but has more problems gaining Duchies so it’s a wash.
Part against Duke slog suggest that Duke player had like 9 $5+ buys which were 8 Duchies and the rest was Duke(s). Knowing this, wouldn’t be better to stop at 6 Duchies and then go for Dukes? The problem is, 6 and 3 doesn’t get the job done – this is only 36 points, less than the full suite of gardens – and that is 9 green cards, so even more than the gardens! Truth, but I’d think that it was an average/typical case so in some games it could have been 10 buys. And 8 duchies+2 dukes = 40vp while 6 duchies+4 dukes = 42 which could result in somewhat better win percentage. Also the Duke player could take away Gardens from the other player with 4$ hands, no? I’m a confused by the result against IW/Gardens. You said Beggars are better at getting to $5 for Duchies, but how likely is it to win the Gardens split? I suppose Ironworks stands a good chance here. And after that IW can just rush on and empty IWs and Estates before Beggar can do its magic slogging. I mean, Beggar is probably stronger anyway, but 19:1 seems quite high… Another interesting question is whether Beggar/IW could be any good (better than Begger alone? ), and how are you going to approach this strategy. I suppose opening IW/Beggar, and use IW to get more Beggars, IWs and other stuff? You probably get a bit faster to the point of greening I guess..? If Beggar loses the Gardens split so it has 3 Gardens each worth 4 at game end = 12 points. Ironworks will have 5 each worth 3 = 15 points. This means Beggar only needs 1 Duchy to get even while in reality it will be able to get multiple Duchies. Ironworks/Beggar is 10% stronger than Beggar alone. You don’t mention estates. IW will try to empty estates, so you need, gasp, 3 duchies. In this game I use Beggar/Gardens to beat a Colony player by a score of 105-93. 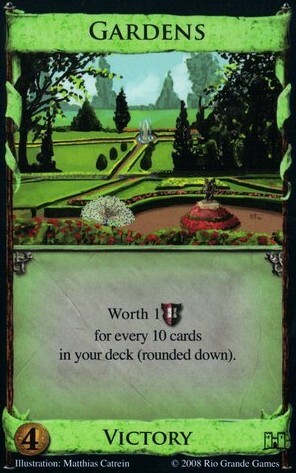 I get Gardens up to 9 points each with a final deck of 90 cards. I also got a boost from Duke/Duchy. Opponent’s play was definitely *ahem* sub-optimal, but hey, it worked! I’ve used a strategy before using villages as starting cards and spamming beggars and coppersmiths after it- a good hand averages about 6 to 9 coppers and 2-3 coppersmiths played. The thing is though, that it only works in one shuffle, and afterwards you have to use a chapel to get rid of the extra coppers. When Should I Start Greening? What expansions should I get?